to start your CHRISTmas shopping early. Because CHRISTmas is the "perfect time"
to support the WAHM community! My good friend Corrie Petersen and her husband Kevin from Heavenly Crosses are pleased to offer 3 cross necklaces for $20. What a great idea for stocking stuffers! This special is only available until November 30th, 2007. Please go to the specials page to order your gifts. and this will take you to the Paypal cart. 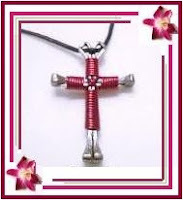 Our cross necklaces, key chains, zipper pulls, and bracelets make great gifts for anyone and everyone. We also have keepsakes for baptisms and confirmations. We have many colors to choose from. You can even design your own cross. Please visit Heavenly Crosses for more information. Be sure to sign up for their newsletter while you are there.